experience. But, it was fun at the same time. I enjoy learning new things and love a challenge! 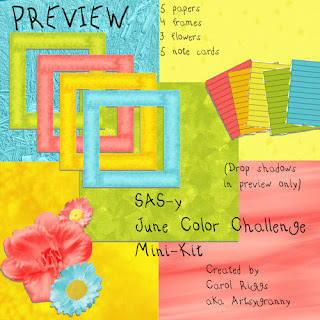 Speaking of challenges, I took the opportunity to enter the June Color Challenge at Stone Accent Studios. The photo above is a preview of the kit. As soon as I figure out how to do it, I will be offering this as a welcome freebie here on my blog, so check back soon. This old granny is tired now, so I think it's time for a little nap. See you soon! I'm just thrilled for you!! Thanks! I'm glad you stopped by. Thank you! Your blog post will be advertised on the DigiFree Digital Scrapbooking Freebie search engine today (look for timestamp: 10 Jul [LA 01:32am, NY 03:32am, UK 08:32am, OZ 06:32pm]).